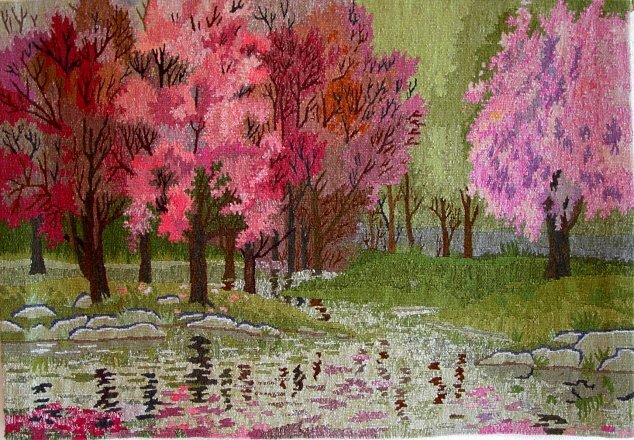 Very beautiful colors and very well woven tapestry. Quality. I am very happy with this tapestry. Above clip shows the process of making these beautiful tapestries. Our gobelin tapestries are designed and woven in Puducherry (former Pondicherry, South-India) with Tapisseries de la Mère, a weaving workshop, established in 1976. Our designer artist has won several design prices. Through the years the female weavers have become master gobelin weavers and are able to weave tapestries with great complexity and full of fine and subtle details. The translation of paintings into weave art is an old tradition, which flowered especially in the Golden Age. Rubens and Frans Hals are examples of painters who themselves made the tapestry designs from their paintings. Recent examples are weave art versions of works of Picasso and Chagall. The art of designing a gobelin tapestry is to translate the experience of the original painting into a new medium: wool. The tapestry should emit the atmosphere, feeling and mood of the original painting and enable us to identify with the subject: because wool is a material very close to our feelings and the handmade character of the tapestry gives a lively impression, our designer artist is often quite successful in recreating in wool the experience of the original. Many of our 300+ designs are inspired by nature. We have many nature designs of contemporary watercolour artists, with views of mountains ‘Winter Landscape’, hills ‘Flowers on Hill’ or ‘Desert Clouds’, valleys ‘California Vineyards’, lakes ‘Scarlet Lake’ or ‘Flowers on Shore’ and beaches ‘Gulls’ or ‘Beach at Sunset’, scenes with nature at sunrise or sunset ‘Sunset Surf’, ‘Sunrise’, with flower impressions like the subtle and light ‘Wisteria’, the colourful and bright ‘Tulip Tapestry’ and ‘Floriade in Bloom’ or the pleasant ‘Tulips and Irises in White’, the bigger than life ‘Anemones’ and ‘Fuchsias’ and animals in their habitat, like ‘Seagulls’, ‘Fish Pond’ or ‘Red Macaws’ and ‘Blue Heron’. There are also a number of beautiful naives ‘Winter Sunday’, ‘January’, ‘Island of the Blessed’ and very joyful and happy designs like ‘Balloons’, where one can only smile when one sees it. A special series is from the American painter John St.John. The designs called ‘Great White Way’, ‘San Juan’, ‘Salisbury City’, ‘Silver Ranges’ and ‘Procession’ are semi-abstract, making one stay intrigued and through which one discovers every time new views and details. The gobelins of John St.John speak directly to our emotions, like ‘The Last Charge’ and are worth the experience. From the impressionistic period we have more than twenty designs from Claude Monet, Camille Pissaro and Auguste Renoir, like the happy ‘Poppy Field’, a number of beautiful ‘Waterlilies’, the almost abstract ‘Garden at Giverny’, the bright ‘Garden Path’, the striking ‘Japanese Bridge at Giverny’, the wild ‘Irises’, the French street in ‘Boulevard des Fosses’ and ‘Stage Coach’, the quiet ‘Canal in France’ or ‘Green Fields’ and the colourful ‘Renoirs Garden’ and the snowy ‘Road in Snow’. Next we have two Limited Edition series. The first one is from Vincent van Gogh, introduced in the Van Gogh Year 1990 at the exhibition. We have translated 26 of his paintings into weave art, including the famous ‘Sunflowers’, ‘Irises’ and ‘the Harvest’. But also the striking ‘Fresh Grass in the Park’, the subtle ‘Wheatfield with Lark’, the beautiful ‘Blooming Almond Brach’ and remarkable ‘Fishing Boats at Saint-Maries’. Worth mentioning is the beautiful ‘Flower Garden’, a relatively unknown painting from a private collection, which was one of the great successes at the exhibition. The second series is from the Dutch painter Pieter Dik. A remarkable painter of nature, who succeeded in bringing out the secret inner life of nature in his paintings. He was a perfectionist who painted for his subject and could so express the inner beauty. We made gobelins of six of his paintings. ‘Hare with Flowers’, ‘Majestic Deer’, the ‘Fox’ and the ‘Pheasants’ are examples of his unique talent and his ability to bring his paintings alive. ‘The Deer in the Forest’ and ‘Sunset with Geese’ are examples of bringing out an atmosphere in which one can dream away again and again. The limited edition gobelins are numbered and with certificate. The limited edition series are higher priced than the other tapestries. The art of gobelin weaving distinguishes itself from other weaving methods by the high weaving skill required. The wool is inserted thread by thread and the design is built up part by part. In one direction the parts are woven separately to make a perfect separation of colours possible (split-weave method). After the tapestry is cut from the loom, the parts are stitched together to finish the tapestry. In weave art a different method from painting is used. The painter always paints himself, but in weave art the artist designs and the weaver makes the piece. The method is as follows: the designer artist draws on a piece of paper -the size of the future tapestry- the contours of every detail to be woven. Within the contours he writes the number of the wool colour, which suits the detail. When a colour mix is required he writes 2 or 3 numbers within the contour, so that the weaver later weaves 2 or 3 colours together. When the design is finished the paper is full with contours filled up with hundreds of wool numbers. Hereafter the paper is copied by hand with the help of carbon paper. After this the weaving can start. The weaver takes the copy paper to her loom and attaches it behind the warp threads. Then every detail is separately woven. After she has put a thread into its place she beats it with a sort of comb to fix it tight. Detail by detail the tapestry is built up and only after the tapestry is cut from the loom the final result can be judged. The quality of the weaving depends on several factors. An important factor is the precision with which the weaver follows the pattern. Another factor is the equality of force the weaver uses when she beats the threads into place. A small detail requires a relatively light touch, while a larger part needs a firm touch. When the force used is not balanced the edges of the tapestry will not be straight or the tapestry will be ‘baggy’. The weaving of a standard size tapestry (60×100 cm) takes 2 to 3,5 weeks, depending on the complexity of the pattern and the skill of the weaver. Bigger tapestries (90×150 cm and 120×180 cm) are woven a little thicker to make the piece more firm. The looms are lined with a cotton warp on which the tapestry is woven using 100% wool. The wool comes from the North-West of India and is of a fine high quality. Most of the wool is dyed in the weaving unit itself. The best commercial dyes are used to ensure uniformity and colour-fastness. But as with all coloured textiles, hanging in direct sunlight must be avoided. The tapestry can be kept bright by vacuum cleaning every once in a while. After many years it can be dry-cleaned. The tapestries are woven in different sizes. There are two standard sizes: first there is the size 60×100 cm, of which the price varies -according to the complexity = weaving hours- from 118 to 136 pounds and the second size is 80×120 cm, of which the price varies from 180 to 216 pounds. Of a number of designs we weave special sizes like 90×150 cm, price 362 pounds and 120×180 cm with price of 616 pounds. Besides there are designs with special measures like the Waterlilies of Monet with the size 90×270 cm (725 pounds), 70×200 cm (435 pounds) or 100×100 cm (225 pounds). If a design is not available at the moment, it can be ordered. It takes 4 to 12 weeks to arrive depending on the fact if it is under way or still has to be woven. The tapestry can be hung with a rod through the sleeve on the back or one can use a strip of velcro attached to the wall on a wooden strip. The wool will adhere to the sticky part of the velcro very well. If you have bought a tapestry already we wish you many happy years with your tapestry and if you have not yet, we hope you will have the pleasure of enjoying one later. Weave Art Gallery La Mère © 2019. All Rights Reserved.